iDirect satellite service for East Africa. iDirect service for Eastern Africa from North Telecom LLC. Eastern Africa coverage: Using Eutelsat 70B at 70.5 Degrees East orbit position. Technology: iDirect SCPC. iDirect TDMA. With the teleport backbone iDirect hub in Germany, they are providing 24/7 efficient and effective support plus a range of value added of services. In collaboration with Eutelsat, the satellite operator, the solution provides coverage in the eastern part of Africa. With North Telecom's expertise in the satellite industry, shared and dedicated requirements will be accommodated and mobilised productively. Fast, efficient and scalable broadband connections are possible between Europe, Africa, Asia and Australia. 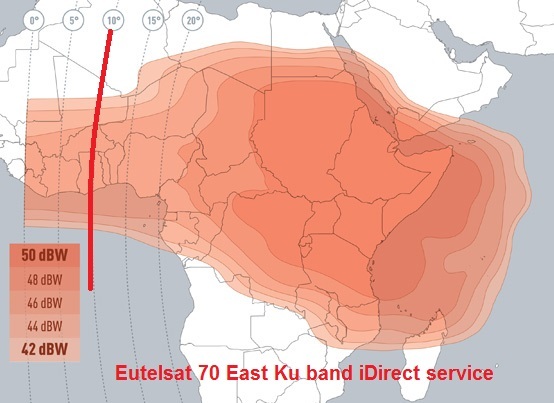 Ku band iDirect service areas coverage map from Eutelsat 70E. The information and images are derived from information provided in an email from North Telecom. This is not a paid for advertisement. Contact North Telecom for more details.